Mark and Pat's Adventures: Logan was right. The Clyde River is not easy. Logan was right. The Clyde River is not easy. The voice of local knowledge told no lie. Going up the Clyde River is work and lots of it. 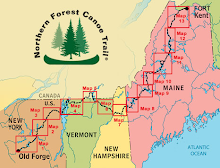 The guidebook says "the 3-mile segment from Clyde Pond to Salem Lake may be the most difficult upstream paddling of the NFCT". The reward toward the end (headwater) of the Clyde River is traveling through the "fen" from Ten Mile Square Road to Five Mile Square Road. A fen is an uncommon form of wetland where the water broadens over a large area and finding the way through is like a giant puzzle. It is packed with wildlife. My favorite part of the trip so far. Giant Bald Eagle nests are right next to the water. They are Big birds! That evening, I arrive at Island Pond and the headwaters of the Clyde. The river goes directly underneath the formerly infamous and now quiet Clyde Hotel. Tired after several hard days, it is time for a "zero" or day off to let the body rebuild. The small town of Island Pond is very hospitable and provides a nice break from the trail.